The Secret Affair — Vikings! So today the Secret Affair opens up. An event that tends to have some really great items in it. The theme for this round was Vikings, or the Path to Valhalla. Of course that’s the sort of thing that works for me rather easily doesn’t it? So, what did I decide to make up. A furniture set. We’re having a game night… Viking style. The set includes two styles of chairs, one carved and one not. 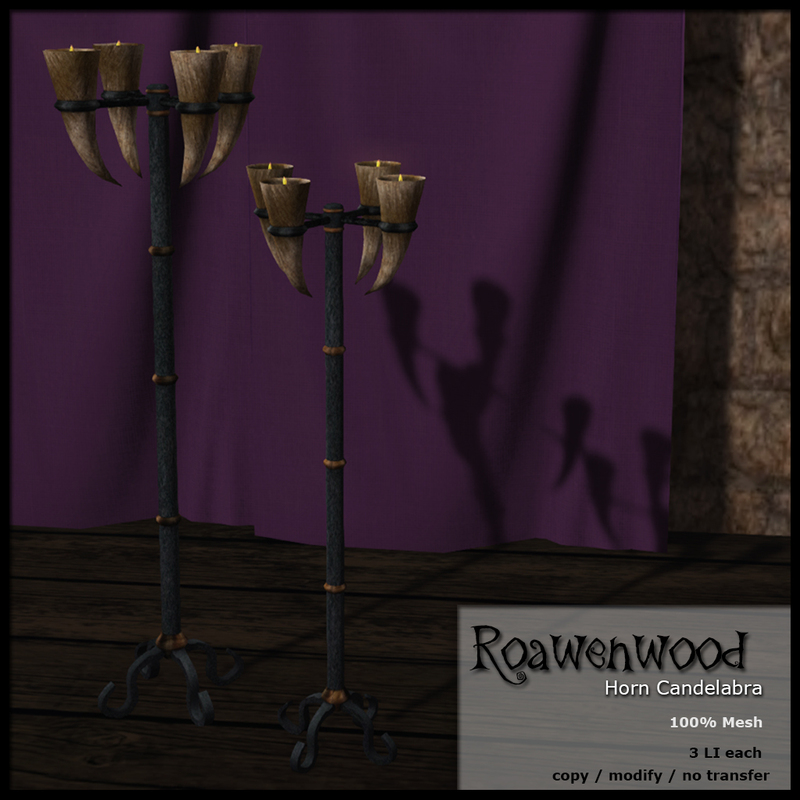 Fuzzy rugs, an horned candelabra and then a small table. The table has a game on top of it. While researching and looking up the chairs to try to be fairly accurate I saw this board game. 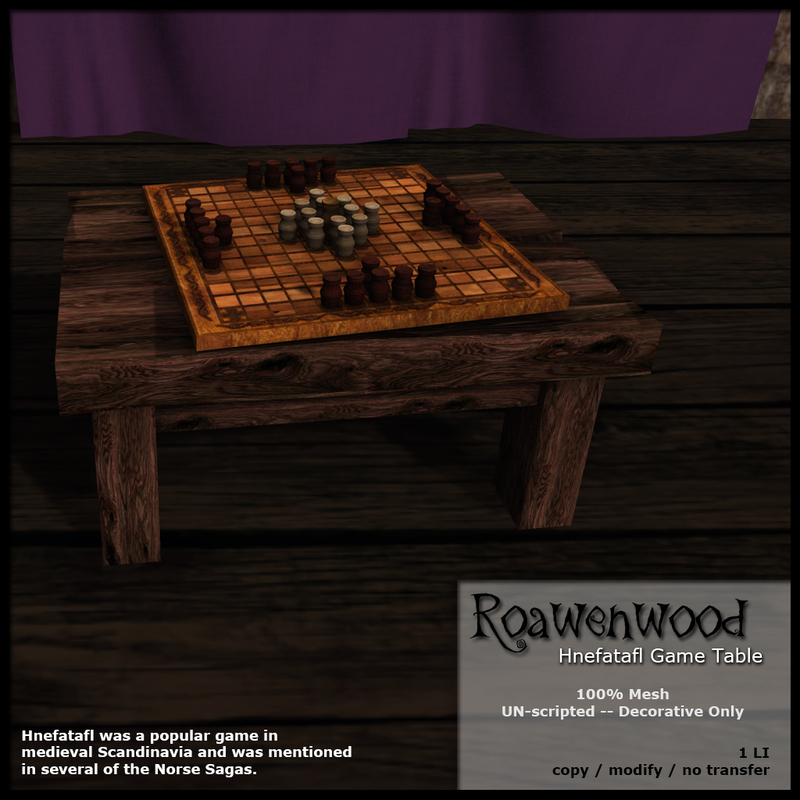 It was called Hnefatafl, meaning the King’s Table. I had never seen it or heard of it before, well come to find out it is a very old game that was favored by the Vikings. A strategy game that fell out of favor as chess grew in popularity it looks like. I found it intriguing thinking of Vikings and the like sitting around in front of a fire or wherever playing strategy games. A way to pass the time. Good conversation and camaraderie during cold months or down times. A way to add a bit of decor along with opportunities maybe to role-play. It is purely decorative but I really like how it turned out. Sadly my product pictures never really get the way I want my stuff to look. I want it to look how I see it but rarely get it done that way, in world this set looks so much better in my opinion. 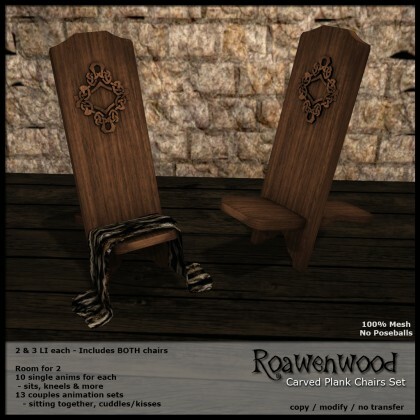 The chairs have quite a few animations. Room for two people there are 10 singles animations for each, and then there are 13 couples sets. Some cuddles, sitting in the lap, kisses, kneeling types that are really rather nice if you like the Master/slave type relationship. I thought it suited it alright. Quiet moments and all that. So there you have it, a set fit for a Viking. You can get it now through the 30th at the event.